paper bag & string: Kitten's New Year's Pawty! Kitten is ready to celebrate the new year! Wishing all my friends a happy, and healthy 2012! All the best to you and your family. I feel so fortunate you are in my life. Happy new year to you too! We hope 2012 brings more laughter than tears, more joy than sorrow. All the best to you. Happy New Year! PS: that is a kitteh who knows how to pawrty!!! Oh my...what a cute, fluffy little ball of fur having a ball on New Year's Eve! Dear God that cat is cute!!!! cute video! Happy New Year! Wonderful! It's not a Happy New Year unless you have a cat in there somewhere. 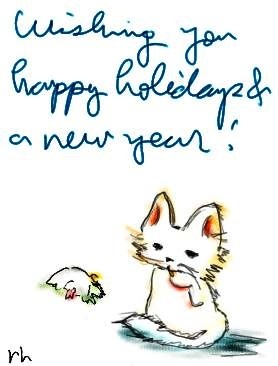 Very best wishes to you for 2012! We hope 2012 is a happy and fun year!! Happy Happy New Year to all of you too. Great video. Love the Kitten watching something going back and forth. Great little dance. Take care. Happy New Year! I love your drawings! Happy New Year. May kittens always make us smile! Happy Happy Mew Year from Allie & da Boyz!!!! Happy New Year to you, Ann! Wishing you all the best and continued success for 2012. xoxo from Allegra, Ruby and me!